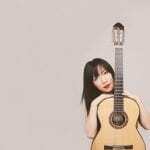 Guitarist Xuefei Yang makes her debut at Edinburgh Festival. To fit in with the Asian theme of this year’s festival, Xuefei Yang played a balanced programme of Chinese and Spanish repertoire, including several of her own arrangements. The View described her playing as having “a style of delicate, detailed precision that was fundamental to every piece in her recital…the Yi Dance, a folk-like tune for festivities, and Butterfly Lovers, inspired by an ancient Chinese love story, were both exquisite in their touching, finely spun tenderness.” Bravo Xuefei!